Two Bears Farm and the Three Cubs: What Will Be in This Year's Easter Baskets? Great idea! Nice job on the pencil bags too. I'm sure the boys will find lots of stuff to put in them. When my Daughter was young, we stuffed her basket full of candy.... Knowing what I know now about sugar... I would be much more into healthy snacks. You are so much more crafty than I am Lisa! I too try not to buy a lot of candy for our Monkeys, and they do love Clif bars, etc. I have been making a variant of Logan Bread (think home made Clif bars but less sticky). My only fear is, if I give them to the kids, they will hog down the whole batch! We love ClifKids snacks! I need to put them in JDaniel's basket. Straight up chocolate in the eggs they'll hunt for--and a couple DECENT toys in the basket, plus a small carton of Whoppers and a package of Peeps. Pretty standard for us--my biggest thing is to not buy any individually wrapped candy so I don't find it stuffed under my furniture!!! I've done the Annie's bunny crackers before. It's nice because they have different flavors. I did cave, and got some chocolate. I usually put traditional candy, healthy treats, simple toys, a movie and a book in them. I don't have any little ones, so I don't have any baskets to make. It would be fun, though! Larry usually gets me some candy if I specify exactly what kind he should get. He is paranoid about getting me something that has nuts in it (allergic). I love the chocolate creme eggs and the little chicks. We do an easter egg hunt with all those plastic eggs - but we fill them with stickers and bunny crackers :-) I also try to give them a little chocolate, but not much! I usually come up with my own theme. One year they got tennis equipment when we went to Canaan for Easter. One year I gave them summer things that I found on clearance in the fall. I always give them the newest dvd's that are coming out the month of Easter. As far as candy goes, they get a lot of candy at church. The schools aren't allowed to give candy here. This year I just got them a Reeces bunny rabbit. Something that I forgot that I got them! lol Since my son is getting braces and can't have sticky candy I bought them both their own thing of Oreo spring cookies. They aren't big on the candy anyway. My daughter will get some fingernail polish in her basket and a pair if sunglasses. My kids don't get things every time we go shopping. Basically they just get Christmas, Easter and their birthdays. Once in a while they might get something just because. That was a great idea to use your pencil pouch! And I love that you give them healthier treats. It's so funny because I know the Clif bars are marketed for kids, but I buy them for my husband and me all the time! They are yummy. 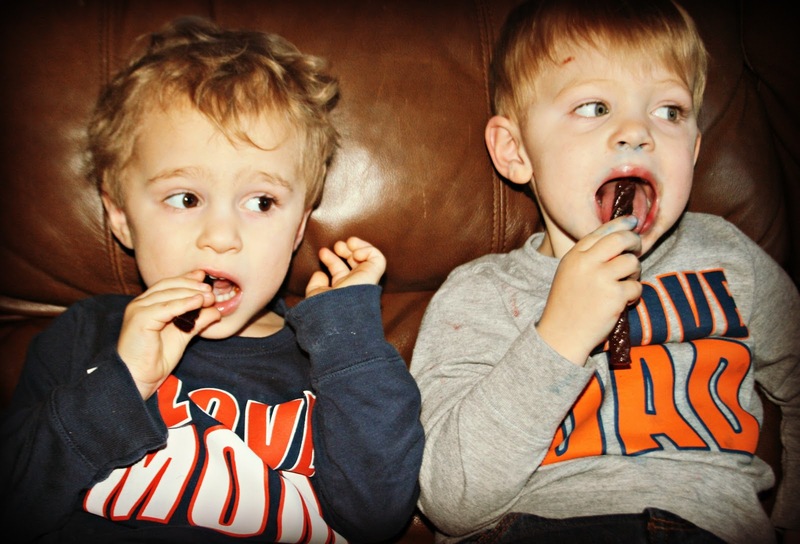 I admire the effort you put into making sure your boys have healthy snacks. You are a good mom. I have to admit that I have always bought the junky but fun stuff for their baskets - jelly beans, marshmallow peeps, a big chocolate bunny, and usually a t-shirt or bathing suit to indicate SPRING IS HERE!!.. I used to also put sidewalk chalk, jumproad, jacks, crayons, etc. in there too. My kids are getting older now though, so they are getting a Nike gift certificate instead of the clothes part, because they like to pick out their own stuff. cute ideas you have. this year i am doing easter prints gift bags from dollar tree for easter baskets for my little ones. just how many baskets do little ones need,i thought. their parents give them baskets and i know they dont want to be storing or stashing easter baskets all year. i filled my easter print gift bags with baby friendly items (since they are too young to eat easter candy) like gerber baby snacks, disposable bibs(their moms will appreciate) a summer outfit, a book, etc. O.K. 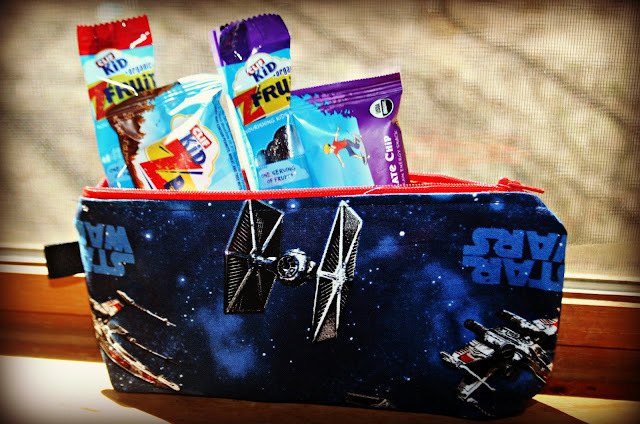 this Star Wars pencil case is AWESOME! I even love it myself and I am a girl. I think you could make money by selling specialized pencil cases, and no one else is doing it. Because I am not the mom of the girls, I feel free to dump in all the junk...er..good stuff that catches my eye. And they are piled very high this year. Not just candy nut little spring toys like light up bunnies and chick erasers and such. Those pencil cases are so adorable. What a great idea! Yes you are. A good mom. Used to do Easter Baskets for my sons ---and even for the grandchildren when they were little. BUT--I agree. Kids don't need all of that candy. There are so many other neat little gifts to give them these days.. I'm sure those Clif products are yumm! I have liked them in the past but they have too much soy protein in them last I checked. I can't do soy! Gives me a horrid ichy throat that I can't get rid of easily. Soy and M&Ms does that to me. Odd, huh? Thanks for saying you like my pink pants! I love them. They are usually sold at Macys for $30! cool. Great idea! My kids are grown up, but when they were small we always got them a big Easter Egg filled with candies. enjoy your week! hope you're feeling better now. Well it's been a long time since I've done baskets. I know if I had grandchildren I would try to go healthier with their baskets. I do give little candy treats to my friends children at bowling. Easter was always about candy at our house! Love the Star Wars pencil case my Mom watches those movies all the time. There is a big age gap in my children so they each get different things. Anika 14- I'm planning on getting her some makeup, a necklace or earrings, a cute shirt and maybe a pair of flip flops or an ITunes Card. Axle- 2 1/2 will be getting things like bubbles, hot wheels, maybe a shirt, some new swim trunks and some craft stuff. Annalee- 8 months will get a stuffed animal, maybe a new bathing suit, some gerber snacks and some new passies. Not sure that is what exactly they are getting but those are just some ideas I have. I like to stay away from the traditional candies and stuff. Good idea to avoid the HFCS. Hope the kids have a great Easter! Wonderful post and great ideas. I like to give the grandchildren a nice basket with a toy some colored eggs and a special treat. This year I am making healthy whole grain cut out cookies and dipping them in organic chocolate. For little Bug I will make a paleo cookie instead. I do like your idea of using a pencil case.